T’ai Chi taught me many things but perhaps nothing quite as useful as the unlearning of the reflex to grasp. 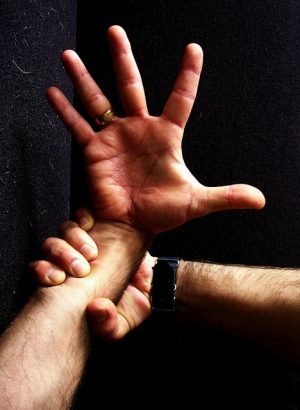 This reflex – to grab hold of something, most often with the dominant hand – becomes a liability in any kind of fight. One problem is that it focuses the mind on the grasping hand: thus focused, the mind loses the ability to see ‘the bigger picture’. Another is that an attempt to grab some part of an opponent is a necessarily difficult procedure: he is most likely to be in motion, and the desire to coordinate the grasping hand with the moving target absorbs altogether too much of your attention. Further, even if you succeed in grasping your target you will become attached to the other person by your own grasp in a way that can be used against you. While all this is going on, much of what your opponent is up to will most likely elude you, and, because of your focus, you are open to essentially ‘surprise attacks’ from those parts of your opponent that you are not monitoring. All in all this is not a brilliant tactic. Thus T’ai Chi seeks to disarm the ‘grasp reflex’, instead training you to remain in a state of overall awareness, and using, for example, the back of the hand, the wrist and the forearm, to make contact with your opponent. This is not done randomly, but with an interest in the areas above or below joints, elbows and knees, the hips etc. Once contact is achieved it is allowed to slide across your body as you roll into your opponent, sensing the movement of his body in space, the dynamics of his weight shifting, until you feel one of his joints nearing a position of disadvantage, his weight passing near a fulcrum where he is close to losing his balance. Only at this point is focus narrowed and your force deployed against him. The aim is to remain uncommitted until the last moment. Thus the practice of the ‘forms’ that, to an outsider, appear to be a gentle dance, but that is the attempt to keep muscles and joints relaxed while in constant motion and, with paired work (‘pushing hands’), maintaining this while impacting and being in contact with the other. I believe this principle is related to the balance of the hemispheres of the brain. What concerns me here, however, is how ‘grasp’ is metaphorically extended to the mental attempt to understand something. It seems to me that everything I have described above can also be applied to this. That when we attempt to understand an issue of any complexity – as the movement of a human opponent in space is complex – any attempt to directly ‘grasp’ that issue will lead only to a clumsy, partial understanding, if not indeed to confusion as it defeats you. When faced with such complexity I have found that it is better to engage it using the ‘edges’ of my mind, to forgo coming to quick conclusions, to keep my mind gently out of focus: understanding naturally emerges from this process, hardening to clarity in its own time. There is a similar construct behind Alexander Technique as it attempts to loosen off physically and mentally from “end-gaining” a focus on a desired outcome e.g grasping. The AT involves performing any action, mental or physical, in a “neutral” way so you are not committed to the action until it is completed. Similarly there was a piece of modelling done some years ago on the martial artist Billy Heggarty regarding what made him better than most of his opponents. The study revealed that he didn’t “punch” or “kick” etc in the way opponets did, but rather moved his body in a fluid way which could become a kick or punch but to which he wasn’t committed.